There is something very revealing about the PN’s reaction to the defection by a former Nationalist Housing Authority chairperson to Labour. An uncharacteristically bitter secretary-general Paul Borg Olivier this week lashed out at Marisa Micallef in the most disparaging terms he could muster: suggesting she had compromised her political principles out of financial desperation; and dismissing her entire stint at the Housing Authority as a case of “government pocket money”. Faced with such an acrimonious reaction, one can only wonder: is this the extent of soul-searching the PN intends to carry out, when faced with such graphic evidence of internal sedition and dissent? Borg Olivier ought to be aware that this latest and much-publicised defection is in reality but a very small symptom of a much wider malaise that has gripped the party in recent months; and – no disrespect intended – Marisa Micallef is herself arguably the least significant of the present or former Nationalist Party malcontents. Truth be told, the PN has far more serious things to worry about at the moment. Our survey today suggests that popular disaffection has now reached critical mass, with 15% of those who voted PN last year claiming they will vote Labour in the next election. We also talk to a number of government backbenchers, and even a cursory read of their comments will confirm that the atmosphere within the parliamentary group is dangerously approaching boiling point. 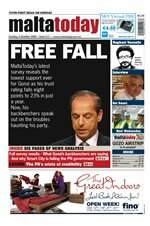 It seems the PN is experiencing the backlash of its successful ‘GonziPN’ strategy last year: in particular, its failure to acknowledge the underlying significance of the March 2008 result, which returned Lawrence Gonzi to power with a wafer-thin majority of less than 50%. Unaccountably, however, the same Lawrence Gonzi continues to behave almost as though he won that election by a veritable landslide: and entirely through his own merits, rather than as an indirect consequence of Alfred Sant’s peculiarities as Opposition leader. More to the point, the Nationalist Party has yet to acknowledge that it has now lost footing in what used to be its strongest and safest electoral stronghold. It is no accident that many of the malcontents either hail from the 10th district themselves, or form a recognisable part of the broader middle-class so recently described (in Anglo-Saxon terms) as “middle Malta”. These people have in recent years been forced to swallow the bitter pill that the Nationalist Party simply no longer speaks their language, and has not done so for years. But their disaffection goes far beyond a sense of “abandonment” by the party they once called home. They have also been hurt financially, to a point where many Nationalists simply no longer believe the conventional perception of their own party as a “safer pair of hands” than Labour when it comes to the economy. So far, Lawrence Gonzi has used the international credit crunch as an excuse to renege on his pre-electoral promise of tax cuts for the middle-income earner. But while this excuse may well be valid, there is no serious justification for his unwise decision to also remove subsidies on electricity, water and gas, at a time when families and small businesses were already struggling to make ends meet. And to add insult to injury, this was done so clumsily, and with such callous indifference, that the overwhelming impression is now of a bulldozer government which perceives its own constituents as little more than a nuisance to be accommodated (if at all) only at the last minute before an election. To this must be added the now inescapable fact that Lawrence Gonzi’s “new way of doing politics” has disappointingly translated into nothing but a continuation of the status quo – camouflaged only by a whole series of spectacular visions of grand projects, which have either failed to get off the ground, or else have fizzled out like damp squibs. Perhaps the most emblematic of these “phantom projects” is Smart City Malta – a dazzling futuristic vision of wealth, job creation and ITC excellence, sold to the people (as usual, on the eve of an election) almost as a “magic wand solution” to all the country’s economic woes... but which has since suffered an unprecedented spate of high-level resignations, and as things stand, its future is, to say the least, uncertain. Admittedly it is not possible to turn the clock back and undo the damage done by these and other fiascos. But it is never too late to at least signal a change in direction. The PN can still do much to salvage its ailing credibility, but as the old maxim goes: the first step towards solving a problem is to acknowledge that the problem actually exists. Evidently, the party has not yet taken this crucial step.